Which Frigidaire upright freezer Is best? There are 13 models of Frigidaire upright freezers. That is more than 2 dozen upright freezers to choose from. With such a dizzying range, homing in on the right model can—understandably—be overwhelming. Fortunately, whether you are looking for a particular size, color or a model that is frost free, energy efficient or has door ajar and temperature alarms, you are likely to find an ideal Frigidaire model. 12.1 cu. ft. (model # FFU12F2HW) has dimensions of 28" W x 25-7/8" D x 60-3/8" H and weighs 142 lbs. These are the smallest Frigidaire upright freezers and if they are way too big, please visit our compact and small upright freezer pages for our top recommendations. 13.7 Cu. Ft. and 14 Cu. Ft. If you are looking for a freezer that is a little bigger, consider the 14.1 cu. ft. (model # FFU14M5HW). It’s white and has a manual defrost system. 16 to 17.0 Cu. Ft.
Next up are the two 16.6 cu ft. uprights: They are the smallest in the flagship Frigidaire Gallery series. Moving next up the capacity ladder, are 3 Frigidaire 16.7 cu. 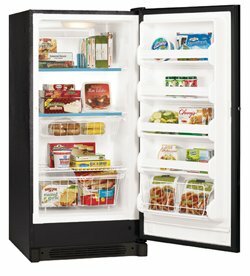 ft. upright freezer models which measure 32" W x 26-5/8" D x 65-7/8" H and weigh 185 lbs. Differences? FFUH17F2NW (white, frost free, mechanical temperature control, Energy Star). Next is the 17.0 cu. ft. freezer (model # FFU17M7HW). It measures 32" W x 26-5/8" D x 65-7/8" H and weighs 200 lbs. Its standout features include a manual defrost operation, adjustable and tilt out door bins, a soft freeze zone and an adjustable temperature dial. The second-largest size is 20.5 cu. ft. and 5 Frigidaire upright freezer models, each with dimensions of 32" W x 28-5/8" D x 71-3/8" H, lay claim to this capacity. FKFH21F7HW (white, frost free, Energy Star, adjustable temperature control). These Frigidaire Gallery upright freezer models’ raft of benefits includes soft freeze zones, frost-free operations, door ajar and temperature alarms, proprietary food organization systems, energy efficiency, digital temperature controls and even a retractable pizza shelf. With all these benefits, it's little wonder that these freezers each weigh 240 lbs, a whole 12 lbs heavier than the identically-sized standard models. The Frigidaire Gallery series even come with a retractable pizza shelf, which is a nice touch. The honor of the largest Frigidaire upright freezer goes to model # FFU21M7HW with a capacity of 20.7 cu. ft. Its dimensions are 32" W x 28-5/8" D x 71-3/8" H and it weighs 235 lbs. 20.5 cu. ft. GLFH21F8HW, which is part of the Frigidaire Gallery series. The latter 2 are part of the Frigidaire Gallery collection and are certified to be energy efficient. If new trends spark your imagination, be sure to check out the 16.7 cu. ft. Frigidaire # FFU17F2PT. It’s clean slate—essentially, gray with a spellbinding tinge of blue. Frost free freezers are an excellent option if you hate squatting and bending over into the freezer to get the ice and water out during the tedious defrosting process. And, with Frigidaire upright frost free freezer, you get far more than just an auto defrost freezer. 20.5 cu. ft. GLFH21F8HB (luxurious, energy efficient, black). Selecting appliances with low energy consumption is a clever way to lower household expenditures. This fact is not lost on the makers of Frigidaire who have unleashed an impressive stream of Energy Stars. 20.5 cu. ft. FKFH21F7HW (white) - consumes only about 691 kWH of energy each year and costs about $74 to run. 20.5 cu. ft. GLFH21F8HW (white) - also consumes only about 691 kWH of energy each year, working out to a yearly electric bill of about $74. If you live or work in a shared space, leaving your freezer unlocked is like putting a big “steal from me” sign on it. 20.5 cu. ft. GLFH21F8HW (white). Anyhow, thankfully, Frigidaire see things in a different light so you don’t have to worry about this aspect. These come as standard features to all Frigidaire upright freezers. Phew! You can set the temperature range of your Frigidaire upright freezer anywhere from -10 to 10°F either mechanically or digitally. What’s more, the digital controls are located at the top of the door exterior, making them easy to read and adjust. Even after you set your freezer temperature, it might still wander outside that range. This may happen, when for example, you inadvertently leave the door open. In freezers with a door ajar alarm, the alarm sounds when the door is left for more than a few minutes—which is all you need to retrieve that frozen veggie pack. In other instances, the appliance might malfunction, causing the temperature to soar beyond the set range. Thankfully, some Frigidaire uprights have monitoring devices to protect your food from frying when it should be freezing. When the temperature rises beyond safe levels, the temperature alarm sounds, enabling you to take measures to prevent food spoilage. A power failure might also cause the freezer temperature to rise above the temperature band. 20.5 cu. ft. FKFH21F7HW (white). 20.5 cu. ft. GLFH21F8HB (black). But with the standard warranty, you can be sure that for 1 year from the date of purchase, the makers of Frigidaire will pay for repairing or replacing defective parts or workmanship. For your warranty to be valid though, the manufacturers only ask that you install, use and maintain the freezer in accordance with the instructions in the manual. Frigidaire upright freezers offer an interesting range of benefits: time saving sizes, energy efficiency, peace of mind, durability and reliable. As such, they are the brand of choice for families that are looking for a freezer that is crammed full of value.